By participating, each patient agrees to the following: Prize is not transferable, redeemable for cash, or exchangeable for any other prize. If the winner cannot be contacted or is disqualified for any reason, Eastern Shore Dental Care reserves the right to determine an alternate winner or not award that winner’s prize. New patients or existing patients who refer new patients are eligible to enter. One entry per person. New patents must complete a new patient exam between April 1 – June 30, 2019. Current patients who refer a new patient are also eligible to win. New patients must list current patient on new patient paperwork in order to be eligible. No purchase necessary. Contest ends on June 30, 2019. One winner will be selected and notified on or about July 1, 2019 by phone. Employees of Eastern Shore Dental Care, Yeti, additional participating sponsors and their advertising agencies, and members of their immediate family or not eligible to participate. By participating, you agree that Eastern Shore Dental Care may disclose personal information to use for PR and marketing purposes. 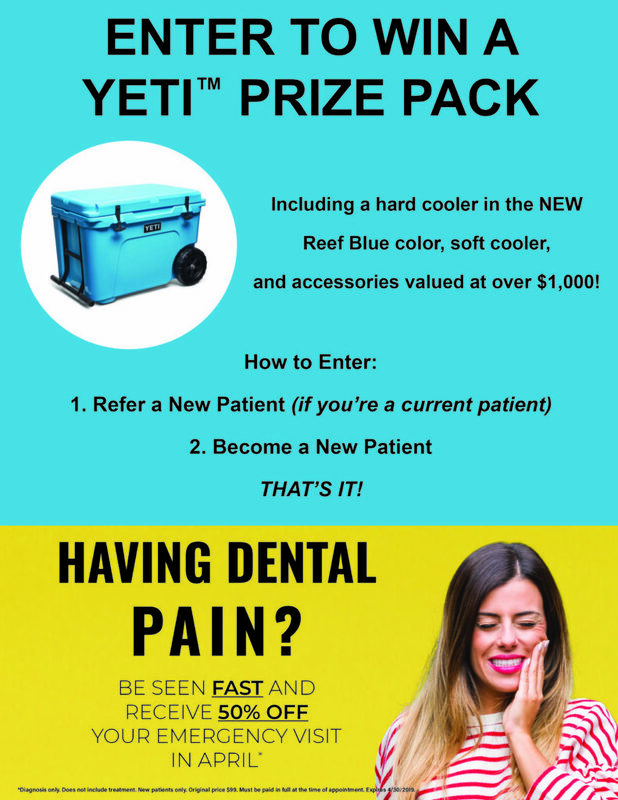 By participating, each patient and winner waives any and all claims of liability against Eastern Shore Dental Care, Yeti, its employees and agents, sponsors and their respective employees and agents, for any personal injury or loss which may occur from the conduct of, or participation in, the contest, or from the use of any prize. All winners must show proof of ID in order to claim their prize. This contest is not sponsored or associated in any way with local media, Facebook, or Instagram. This contest is not sponsored by Yeti. By participating, patients agree to be bound by the decisions of Eastern Shore Dental Care personnel. Anyone who violates the rules or obtain winner status using fraudulent means will be disqualified. Eastern Shore Dental Care will interpret these rules to resolve any disputes or conflicts. If the contest is affected by human error, mechanical malfunction or failure, intentional interference, or any event beyond the control of Eastern Shore Dental Care, they reserve the right to terminate the contest. All decisions made by Eastern Shore Dental Care are final. Void where prohibited. Odds of winning depend on the number of entries received.